Small Marazion bowl - 3⅝" (92 mm) diameter, 1⅜" (34 mm) high. George Nash was already a potter before the Second World War when he met Heather Oates, a hairdresser from Marazion. Marazion was a picturesque village overlooking St Michael's Mount, a rocky island with a castle-like building that was originally a convent, off the Cornish coast near Penzance. Marazion is still picturesque and still overlooks the island, but although still small it now enjoys 'town' status. George and Heather married during the war and set up home in Green Lane Marazion. After the war George continued to pot and in 1950 the couple established Marazion Pottery at Green Lane. 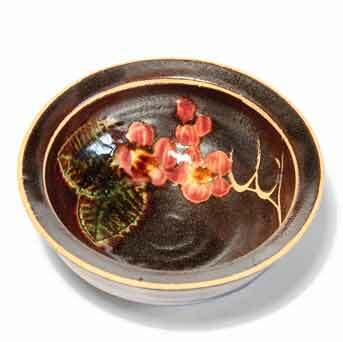 Their early work was mainly domestic and usually with a dark brown or black glaze. Sometimes they used a leaf-green glaze and towards the end of the decade were making more ornamental and decorative pieces. By the early 1960's they had developed their familiar style of a charcoal glaze with sgraffito designs and painted flowers. These designs were popular and the couple continued to make them until 1981, supplying local shops and selling to tourists direct from the pottery. They both died a short while after retiring.